Spring cleaning — it's a timeless tradition that makes perfect sense … until you think about it for a minute or two. Why does everyone wait until spring to start that deep clean? Wouldn't winter be a more ideal time to tend to all things indoors? Let's turn this unquestioned custom upside down. 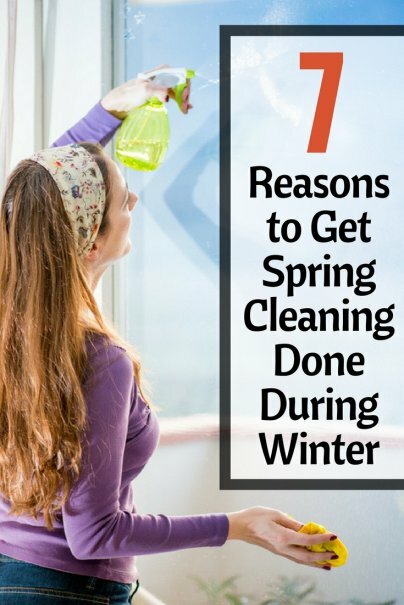 Here are seven reasons to get spring cleaning done during the dark and dreary months of winter. If you're like most Americans, you probably have loads of new trinkets and gadgets coming into your homes during the holidays. As long as you're organizing your haul, why not clean out your closets, rearrange the attic, and clear out the garage to make room for your new toys? Stuffy noses, sore throats, and sneezing — they're all part of the magic of the chilly season. But a thorough winter clean can help you keep the nastiest germs and viruses at bay. If your family is already under the weather, a deep clean can prevent a second round of sickness. With everyone home for the holiday break and the following snow days, it's much easier to declutter. Get the whole family involved; decide together which items can go and which should stay. Then, assign each person a simple cleaning chore and make short work of long to-do lists. Spring is still a few months away. However, you know you'll have to buckle down and get this time-consuming deep clean done eventually, so why not cross it off your list now? Completing necessary tasks early will make you feel accomplished, stress-free, and will keep you motivated to keep checking those boxes and chasing your New Year's goals.